Weekly Photo Challenge: An Unusual POV (Take 2) – Travel. Garden. Eat. 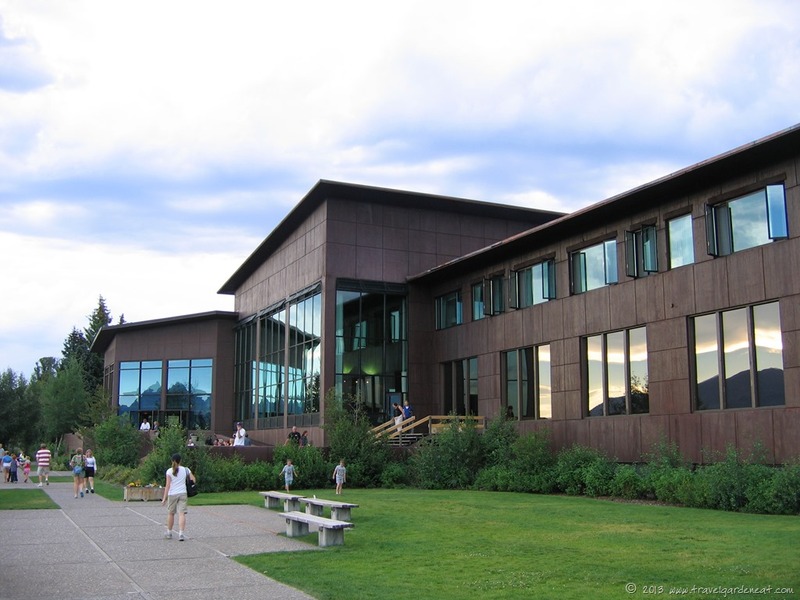 To make up for the bold appeal for my son’s scholarship pursuits in my last two posts, I will take you to the beautiful setting of the Jackson Lake Lodge in Grand Teton National Park. The sun setting over the mountains, the elk moving across the Willow Flats marsh . . . add a fine meal on top of it and you have the formula for a travel memory that endures. 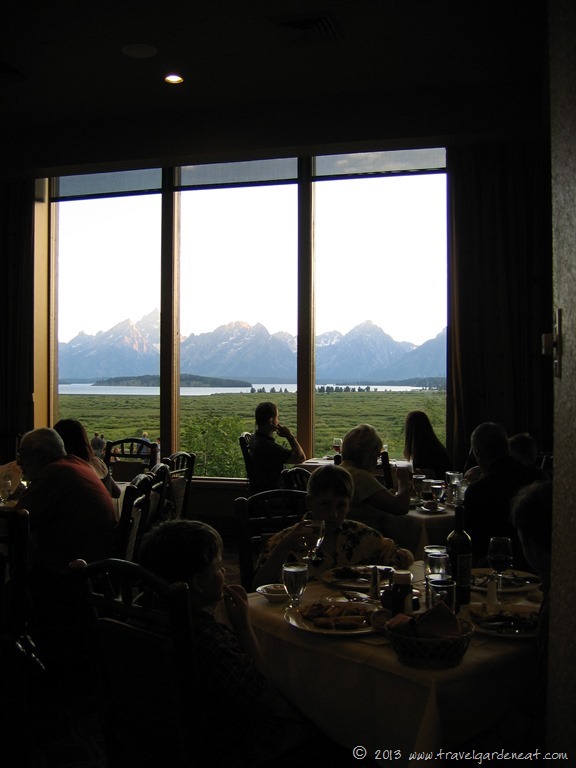 The traditional picture is often the full view of the mountain range as the sun sets on the flats . . .
. . . but looking behind me, I could enjoy the beauty of the sunset reflected in the windows of the Lodge . . .
. . . and continue to drink in the scenery as we savored that memorable meal many years ago in the Lodge’s Mural Dining Room. No matter which point of view you chose, that breathtaking vista was there. This post was in response to the Daily Post’s Weekly Photo Challenge. ”An Unusual POV” was this week’s theme. Everyone is welcome to join in the Challenge; further details on how to participate and links to others’ responses are found here. We need to get there sometime soon – so beautiful! We did a quick overnight in the Tetons at the end of a road trip to Yellowstone with most of the week spent in Yellowstone — we need to get back some day to spend more time hiking in the Tetons (heck, the same could be said for Yellowstone!) The boys were 9 and 11 at the time we did this trip. I have always enjoyed the craggy outline of the Teton’s. Such a beautiful place. I haven’t been there in over two decades. I hope someday I see them again! 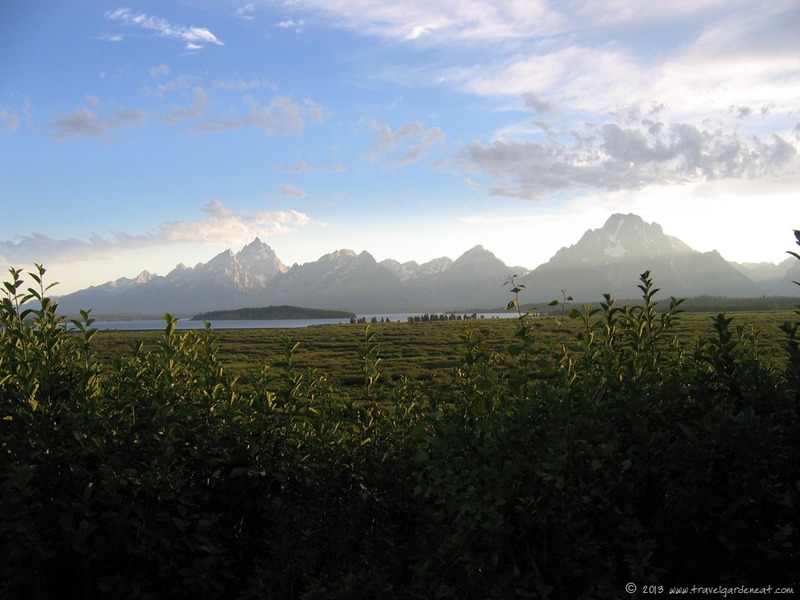 We did not have enough time in the Tetons when we visited — so many beautiful places to explore in that region. I am hoping to get back some day again, too. That is just neat! Sitting at a restaurant with that view… Remarkable! I never had it, really. I guess the view in the restaurant is far and wide for everyone to see. It was a special splurge, and the timing was wonderful as the sun set. Our “out west” road trips (which unfortunately never extended beyond western Montana and western Colorado — all of a sudden, we’re staring senior year in the face and have run out of summer road trip sessions!) are full of great classic family destinations! I need to get back again some day — always new corners to explore in this beautiful country. Thanks as always for taking time to comment, John.